We have created this series of eBooks, divided into four stand-alone sections, written as a series for the man or woman who is making a transition from one job to another, or who wants to find employment after being laid off. Each of the four Job Search eBooks in this series covers one subject completely. Each section is designed to be used separately. You can acquire one, or more, of these eBooks, according to your personal needs. Each fully explains, in detail, a single subject, so you can absorb it easily to improve one important part of your job search. Each deals with a Critical Area involved in finding a new job. You can acquire these eBooks individually, according to your personal needs, or in any combination you find useful. ● All are based on real experiences my clients had finding, and getting, jobs. ● Documents used are real. ● Tips, techniques, insightful anecdotes all have been designed to illustrate a point and, likewise, come from real life. ● Each separate eBook contains step-by-step instructions showing how to do the right things at the appropriate time in a job search. ● Each is written in the same straight-forward, easy-to-read style. ● Each is exactly what I would counsel a client to do at every twist and turn of their job search. ● Each covers a Critical Milestone in any job search, except for networking, which is valuable on its own, to uncover “hidden jobs”. ● Each covers the subject-matter completely. ● There’s nothing extraneous, it’s all concisely written, no “filler” material here. “If you follow these eBooks, it’s almost all you need. It’s good to have someone to talk to, but if a person can’t afford to hire a coach on a regular basis, this is the best alternative. I know it works because it got me the job I’m leaving and the one I’m going to.” — Elaine J. Start sending out your personal “Killer” Resume this week. Based on fifteen years’ experience as a job coach, showing what actually worked to get jobs for my clients. This step-by-step, easy-to-follow, detailed eBookcontains everything you’ll ever need. Learn how to build a powerhouse of a resume. I’ll show you how what worked for my clients can help you get your own job. Includes actual documents, examples of real resumes that got clients jobs, proven techniques and tips. Written especially for the “do-it-yourself-er.” Includes everything needed to create your own “Killer” Resume. Fully guaranteed. You must be fully satisfied or your money back! #1 in the series. Create your own personalized Cover Letters that get interviews. Learn the surefire technique for quickly turning out Cover Letter after Cover Letter, eliminating the need to re-write your Resume every time. Based on fifteen years’ experience as a job coach, showing what actually worked to get interviews for my clients. This step-by-step, easy-to-follow, detailed eBook contains everything you’ll ever need. I’ll show you how what worked for my clients can help you get your own job. Includes actual documents, examples of real cover letters, job descriptions and how to respond to them, proven techniques and tips. Written especially for the “do-it-yourself-er.” Includes everything needed to create your own personalized Cover Letters. Fully guaranteed. You must be fully satisfied or your money back! #2 in the series. Walk into Interviews with confidence. This eBook teaches you what to say and how to act to get that job. Based on fifteen years’ experience as a job coach, showing what actually worked to get chosen for the job. A step-by-step, easy-to-follow, detailed eBook that contains everything you’ll ever need. I’ll show you just what worked for my clients in their interviews to help you become the candidate of choice. 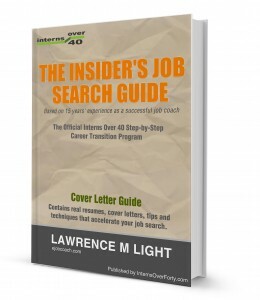 Includes actual documents, interview scenarios, job descriptions, proven techniques and tips. Written especially for the “do-it-yourself-er.” Shows what works in all types of interviews. Covers everything you need to dispel anxiety about Interviewing. Fully guaranteed. You must be fully satisfied or your money back! #3 in the series. Scared of Networking? Don’t know what to do? Afraid you don’t have the skills required for it? This eBook makes it simple, shows you how many of my clients experienced success with it. I’ve broken it down into simple, easy-to-follow steps that anyone, even shy people, can use to get started and, once started, build a powerful network to find “hidden” jobs and information you’ll need to get your next job. Based on fifteen years’ experience as a job coach, showing what actually worked in the real world. A step-by-step, easy-to-follow, detailed eBookthat contains everything you’ll ever need. I’ll show you just what worked for my clients as they began networking and help you become an expert at it. Includes actual networking scenarios, what to do, proven techniques and tips. Written especially for the “do-it-yourself-er.” Shows what works and how to do it, so you never have to “cold call.” Covers everything you need to know about Networking. Fully guaranteed. You must be fully satisfied or your money back! #4 in the series. Your “No Risk” Guarantee because we know that each of these eBooks will be extremely helpful, and to assure you that they will really work for you, I personally guarantee that you’ll find them to be everything we say they are; if, for any reason, you’re dissatisfied, I’ll refund your full price, no questions asked. Just send me an e-mail and I’ll have the refund issued immediately.